Place blueberries and sugar in a food processor and process until smooth. Press mixture through a fine mesh sieve set over a small sauce pan. Heat the blueberry sauce over medium heat until thickened and bubbly. Remove sauce from heat and stir in lemon juice. Cover to keep warm while you prepare the French toast. Using an electric mixer (it breaks up the egg whites better than a whisk), blend together the eggs, egg yolks, milk, flour, cinnamon and vanilla in a medium bowl. Preheat a large skillet over medium heat. Throw in a pat of butter and swirl it around. Dip a slice of bread into the egg mixture and let soak for 10 seconds per side. Immediately place the soaked bread into the skillet and cook until golden brown on both sides, flipping at least once. Repeat with remaining bread. You can keep the French toast a warm oven if you are making a double or triple batch. 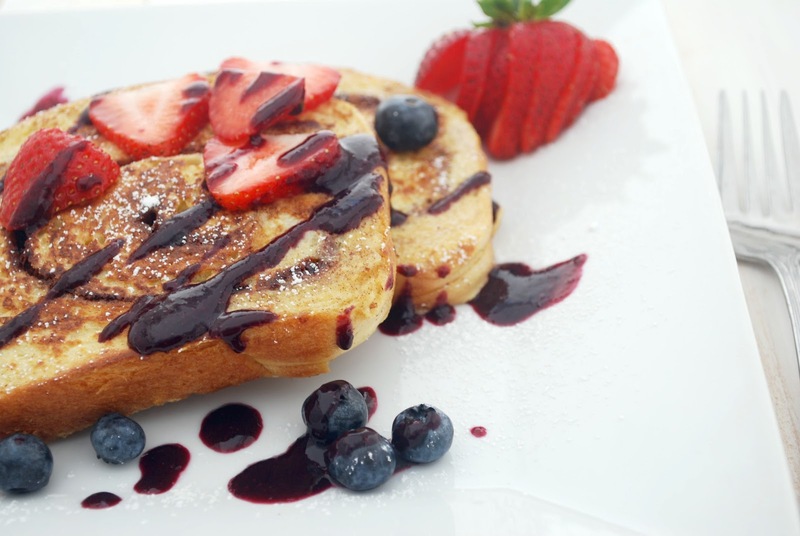 Serve French toast with a generous drizzle of blueberry sauce and a handful of fresh blueberries and strawberries.